Have you ever wondered why certain objects are recyclable and others not? And what is the difference between recycling a milk carton and a cellphone? The truth of the matter is that the differences lie in the material compositions, material quality, product volume, reusability, economic value, recycling facility capabilities and ease of component separation. Certain facilities are more capable of handling specific types of waste than others, due to any of the above reasons. Par exemple, the City of Windsor’s recycling facilities recycle many different kinds of plastic, but stationery is NOT one of them. Why, you may ask. 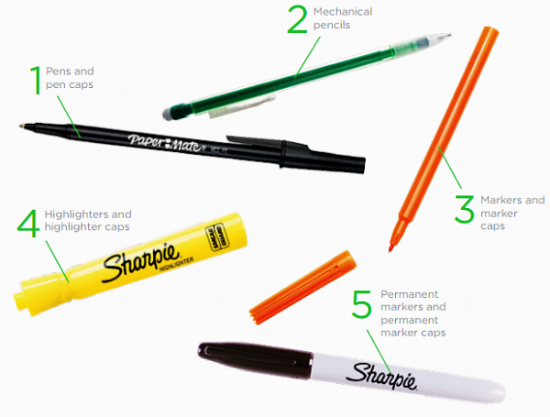 How can I recycle my pens and markers, may be another important question you may have. How important is it that stationery gets recycled, may be another question. Luckily for you, there are answers. 1. WHY can I not just dump my stationery along with my other plastics? That's like wanting to make a cappuccino, but with oolong tea leaves. Cappuccinos have different ingredients than tea, and similarly, plastics are of numerous different kinds. Regular Tupperware is compositionally different from a pen or a mechanical pencil. Tupperware is all plastic, whereas pens consist of various intricate messy insides made of metal, ink and plastic. If the recycling facility were to dismantle and sort out each and every one of our stationery pieces, imagine how long that would take! Not to mention, how inefficient and cumbersome the whole practice would be with all the time, money and labour being diverted away from sorting the bulkier stuff. 2. But I want to recycle them! I want to, I want to, I want to! Fine, fine. If that’s the case, I’m with you. And there is a solution. It’s called the Staples Recycling Program. If you are not familiar with this genius venture, Terracycle, which is a Canadian recycling company that prides itself in “Eliminating the idea of waste by recycling the unrecyclable”, teamed up with our very dear Staples to help us with this herculean conundrum! You can now collect all of your stationery from your home (or set up a collection at your office, public library, retailer, daycare, school etc.) and drop them off at your nearest Staples store to be recycled. 3. But how important is this? Very. Not only because every bit counts, but also because every year countless different miscellaneous types of recyclable, reusable articles end up in dumpsters and landfills. This turns into an awful loss of recoverable resources. Stationery is just one simple but important example of it. Also, plastics and other intricate objects have a way of finding themselves in waterways and animal habitats which is detrimental to our and others’ health. Additionally, through this program, not only are you helping the environment, but for each writing instrument that gets recycled, $0.02 is donated to Earth Day Canada. Win win!! So hurry up and make like Barney. Gather your friends and pens and rush to the nearest Staples location.